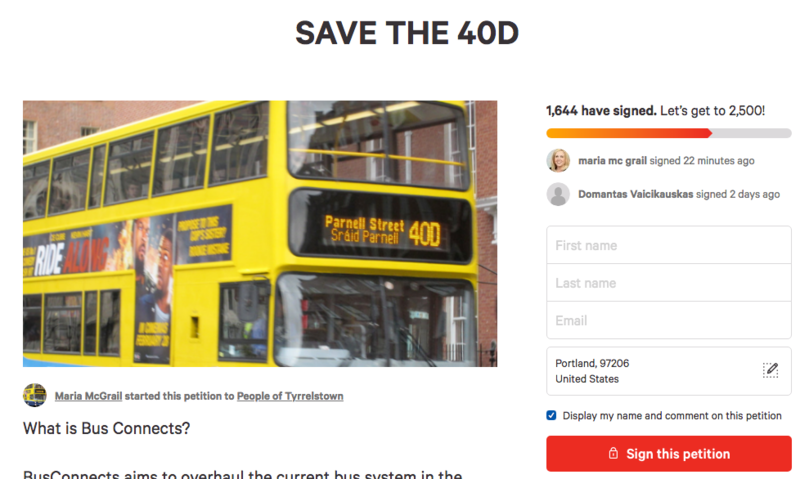 In terms of saving the 40D I believe people mainly want to be able to go from Tyrrelstown (pop 3275 https://www.citypopulation.de/php/ireland-dublin.php?cityid=04015) and the nearby townlands (which are growing rapidly) want to be able to get to the city centre in around the current time of 45 minutes. According to your tweet https://twitter.com/humantransit/status/1038801326270963712 there will not be a direct service that is more frequent than today. Which might be ok if the total journey time was similar. Blanchardstown Shopping Centre tends to have bad traffic November and December due to Christmas shopping and in general on weekends. It could be that the new buses can bypass this traffic in some way but I cannot find that part of the plan. This hub and spoke (please correct me if this is the wrong term) could in general be a better model. Particularly if the hubs are not congested. But I believe the residents of Tyrrelstown are worried the Blanchardstown hub will be congested. See, this is a helpful comment! Yes, we will use the comparative map tool to see if we can improve travel times to the city, even if we can’t offer a single-bus service. Additionally of concern to Tyrrelstown is the volume of service. Today between 7 AM and 8 AM 34 buses travel down the Navan Road and the new plan suggests 12 to 14. I struggle to see how we can get the volume into the City and furthermore facilitate wheelchair users. Like David I have concerns over the Shopping Centre and traffic for a hub solution. Maybe routes like the 40D et. al. should remain during rush hour and be heavily would back off peak to keep people moving? The map only shows off-peak service. During the peak there seems to be a frequency closer to 26 buses an hour, with the B spine at 12, 35/37 at 8 (12 during one hour), 360 at 4 and 363 at 2. The 40d is every 15 mins before 9 and after 4 which is not infrequent and facilitates people working in city centre and school goers. What are those passengers supposed to do if route has to change or takes longer? Resign and look for work in blanchardstown centre? Change schools? Have any of the planners tried driving into blanchardstown centre at peak time at moment, never mind Xmas when it could take hour to get out of centre without the increased volume of buses. Even yesterday it took us twenty minutes in traffic to get into centre at 3pm on a Saturday! You talk about false assumptions yet state that Tyrrelstown “has some low income families that are likely”. That sounds like assumptions to me. Wheres the facts and figures on Tyrrelstown and townlands you’re basing this on? I assume that someone who has been redesigning routes for 25 years has stopped caring anymore what people actually want and need and is content delivering a solution, that whilst palatable to politicians, doesnt serve communities. The 40d isnt particularly great, it spends too much time meandering round places and isnt direct enough. More people currently prefer to drive. You are only going to add to that. The new proposal makes things worse. Rather than spending a few minutes in winter waiting in the cold, knowing once I am on the bus I’ll get into town I’ve now additional outdoor waiting time. I would have thought your role was to make the bus routes a viable alternative to driving. This is the opposite. Did that feel good, Richard? It’s almost universally true that lower-income people work in less specialised jobs, and less specialised jobs, on average, are less likely to be in the city centre. They are retail, industrial, and medical jobs that are all over the city. That’s true of most cities I’ve worked in. Since that didn’t make immediate sense to you, you spew ignorant slurs about my motivations. Read this blog a little more and see if I’m the monster you need me to be. Nevertheless, I have deleted the sentence that offended you. It’s true in general and on average, but it was beside the point and seems to be confusing people. Mr Walker I think you may need to reconsider some of your statements here. Particularly about the low income families. Assumptions like that are going to get you no fans here. I travel daily to the city centre from Tyrrelstown and the 40d as it stands is a terrible route. It needs to be reworked but the way that this has been explained to the public has been ill mannered and ill considered. We worry about the ability for this plan to work due to the lack of facilities in the area and for the amount of traffic in the area suggested. If we do bring this in and it makes it worse we feel there is no way back from this. Sam. I have removed the sentence that seemed to offend you and others, although it is true in general. We are aware of the traffic issues around Blanch Centre. We never said that the plan would be implemented without those issues being addressed. If you have heard that, you are listening to sources you shouldn’t be trusting. I am not defending our communications strategy. It was designed to lay out a plan and collect comments. It was not designed to withstand an aggressive campaign of exaggerations and falsehoods designed to induce needless panic and anxiety. I expect will do it differently next time. Could have used Brisbane circa 2013 as a case study in this. So much good work in the planning, and lots of scope for improvement on the status quo, only for it to be all thrown in the bin on a political whim. You’re using terms like “in general”, “almost universally”, “on average”, “less likely”. This tends to point to the fact that you haven’t evidence or done any research, you’re just making assumptions that you hope are true. Tyrrelstown isn’t average. It was built prior to the housing crash. There are plenty of people who have been caught, and are still in negative equity and are still not able to move out. Apartments selling for €310k in 2007 are still barely scraping €200k. These people were young professionals 11-12 years ago and Tyrrelstown was one of the few areas they could afford at the peak. It doesn’t matter that they have been promoted and many earn above-average wages they are still in Tyrrlestown. Sure, some people who bought early have been able to move out and the lower prices have meant they are more affordable, and there are people who have left and have rented out places. What’s one of the factors behind the low house prices? Poor transport links. Everyone who has studied a field for a long time will know what generalisations can be made with confidence. When I use those terms I mean “as I’ve observed in every city I’ve seen in 25 years of work,” and that counts for something. Our data analysis was exhaustive based on available info, as our report shows. The negative equity situation you describe is common. We are not saying that travel into the city isn’t important, and we’ll review if express services is needed during the peak. However, it’s also a problem that it’s so hard to get to other obvious destinations that would be in high demand, such as Blanch Centre and the hospital. You’ve worked in Sydney so you’ll be familiar with the way things are done in NSW. Not Sydney but the NSW government did a huge redesign of the bus network in Newcastle where they cancelled and rerouted lots of routes, bumped up frequencies on key routes and made the network less confusing. But they didn’t this without any community consultation or input. None, zilch community consultation. But they kept the full new network under wraps only until when it was time to go, I think there was only 2 weeks for people to look at it before it launched. Very short. Of course, once the new network was released, the community backlash was very swift and angry but the good thing (if there is one) was they made tweaks to the new network from the feedback once it launched so they didn’t have to have to make tweaks early on as it was being designed. And I have to say, compared with this Dublin story, it seems a lot easier politically and generally to do the bus redesign behind closed doors and launch it 2 weeks out. That way you don’t have to deal with protesters while designing it and 2 weeks is too short to organize. You can still respond, just not while you’re designing it. Just a different way but very NSW. Oh crap, this was meant to be a fresh comment, not a reply. If you can fix this Jarrett please, would appreciate it. This community is built on the rout of the 40d. People work in Fingulas,Phibsbouragh Dorset st and city centre. Not The Navin road and Cabra. So why change the route. There are people working in the factories beside Tyrellstown and they come from the areas which the bus route comes from and the busses are full and sometimes over full, So what you are suggesting is tough. I’m getting paid to sort out the bus route and if it means people have to get two buses or more so be it and at the end of the day You will walk away with your big paycheck and forget about us. You said you worked all over the world. So that means you don’t stay long and see how you can disrupt and cripple people trying to keep the banks from there doors and food on the table. You have not lived here so why can you sit in your office and tell us. Were changing your whole way of commuting. 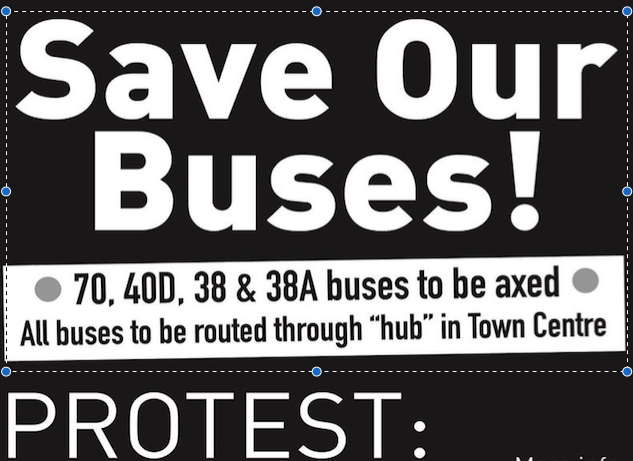 Which will mean having to get two or three buses to work now?. Or get a bus and then the Luis which is not part of Dublin bus. So they are losing money. We have kids here who go to school in Finglas and Glasnevin. What are we suppose to do about that?. Send them on a mystery tour every morning and afternoon. You just don’t get it. You come in all guns blazing and say change this and that. Without asking the people who live here what they want. So stop destroying our community and lives. We pay taxes and want our rights. People from here work across the board from manual to doctors. From park time to full time and we want to keep our service. You want reasons we are the reason. Us our families and our jobs. I’ve looked at the proposals and like other Tyrrelstown residents I’m concerned about the new routes. I’m concerned that a number of routes will all land into Blanchardstown with all passengers wanting to get on the same bus into the city centre and will end up hanging around waiting for the next bus but in the mean time more buses have arrived with passengers all wanting to get on the same city centre bus. I’m also concerned that if you are not getting on a bus in the city centre itself on the commute home that the buses will be full before they even get halfway down the quays and it will be the same on all B spine buses at peak times. I’ve looked at the proposed route for Tyrrelstown residents to get to areas that the 40D travels through now, like Finglas and it will be a two bus journey. Many of the residents in Tyrrelstown bought here because they were originally from areas like Finglas, Phibsboro and Glasnevin and the 40D route allowed them to get to the family home without any huge hassle. To get from Harts Corner to Tyrrelstown on the proposed route is 2 buses with the second doing a tour of Dublin 15 first or 3 buses. (Open to correction if I have this wrong) This journey currently takes less than 30 mins at peak times but how long will it take on the proposed route. Can you please look at alternatives for the 40d route that doesn’t bring it towards Blanchardstown but travels along the existing route towards the city and if adding the bus to number of buses on Dorset Street is a problem re route it so that it travels towards the quays via Phibsboro and Church street (as far as I can see only one other bus will travel down Church Street so no huge build up of buses on that part of route) This would mean that passengers going south side can have option of getting a luas at Broadstone and the Four Courts Luas stop would be on the route for other passengers to use if needs be. The plan replaces portions of 40D with direct service to Broombridge Luas station, for easy access to the city, and other portions with a frequent line to DCU that connects with many opportunities to travel to different parts of the city. Please do not panic about peak loading problems. These will be addressed in the next draft. If it turns out we need peak express service into the city from Tyrrelstown, we will add it. We have not had very good data on this. Getting to Broombridge is all well and good but have you looked at the mayhem that is there in the mornings when passengers getting off the commuter trains are getting on the luas. The luas is almost full as it is and adding more passengers from Dublin Bus will make it worse. This is why I suggested Broadstone as an alternative as I’m told that people have already gotten off by this stop. The luas from Broombridge isnt frequent enough at peak times either so that will need to be addressed to. You could replace Dublin with Detroit and the 40D with route 4, or any route really, and it would sound very similar. The city has many legacy bus routes reflecting the names and patterns of street rails not seen since the 1950s, despite the drastic population shift that has occurred since then. The city’s Dept. of Transportation is working on improving its network over the next few years and that requires change in a city caught at the intersection between preservation and a hopeful (and contested) renaissance. Often the loudest voices express dissent, even if they have incorrect information and offer no alternatives aside to leave the system as is, while those who approve tend to stay quiet. Each major service change prompts transit advocates to yell about impacts to seniors set in their ways or erasing their personal childhood history of riding the bus, which are poor reasons to keep an inefficient system as is. The phrase “if it aint broke, don’t fix it” reflects the sentiment here, except that the system has been broke for so long that many don’t see it, or formed their riding habits to work around it and have little interest in forming new ones. 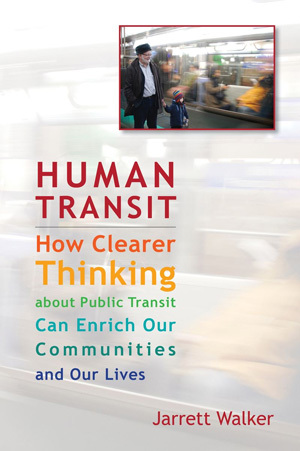 When transit is used as a political tool, as it often is, those loud voices tend to influence policy makers who have limited knowledge of what the transit system is or how it works. Improving a network, even slightly, becomes a struggle. Transit policy boards don’t want to hear complaints. They often don’t want to make changes even if the number of beneficiaries far outweighs the number of losers. One opponent may be enough. Somebody will lose in a “cost neutral” situation. As long as this situation holds, it’s going to be hard to make positive changes, except in the situations where there’s more money to spend. To take an example, Jarrett notes that changes to the 40D will allow more frequent trips to the local shopping center. That might *seem* to be a benefit that might be worth trading off slight changes to access to the CBD. But it may be the case that people have more *flexibility* in their travel arrangements to go shopping than they do when they go to work, It might be small changes to their work commute are very problematic, while increasing frequency for shopping doesn’t provide much of an improvement. In some ways, this is a feature, not a bug. Transit is lauded for its place-making abilities, centering investments (both capital and personal) on the fixed locations of stops and stations and lines. The flip side to that is that people that use transit become very reliant on those stop/station locations, and you cause them real pain when you start shifting them around. It may be the case that *even though* a new system would be more efficient than the old system, because so many people have made life decisions based on the existing system that it’s *not worth* making the changes due to that path dependence.